Taichung, Taiwan (January 24, 2017) – Christie, a leader in creating and sharing the world’s best visual and audio experiences, is pleased to announce the opening of an “all Christie” cinema complex boasting its state-of-the-art cinema projection and immersive audio in Taichung, central Taiwan. Operated by Showtime Cinemas, the 17-hall Taichung Showtime Cinemas located within the new Taichung Showtime Plaza is poised to deliver the most exciting and lifelike cinematic experience to movie-goers. It is the first cinema in Taiwan to be equipped with Christie RGB laser projection system with enhanced wavelength diversification (EWD) that offers unprecedented brightness, image quality, stability and flexibility. In addition, all halls feature Christie Vive Audio cinema sound system utilizing efficient ribbon driver technology and a unique parabolic line array design in a single compact cabinet to provide exceptionally even coverage throughout every auditorium. 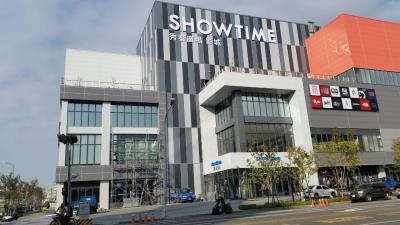 The installations for Showtime Cinemas – an existing Christie user – are undertaken and completed by Christie’s longstanding Taiwanese partner, Dacoms Technology, with support from Showtime and Christie’s technical teams. The Christie CP42LH3DLP 4K RGB laser projector, fitted in the premium Hall 1 auditorium housing a 22-meter screen and 340 seats, is connected via fiber optic to a laser rack housing nine laser modules that outputs multiple combinations of RGB primary color wavelengths, capable of generating 45,000 lumens of white light to offer a spectacular 3D viewing experience on silver screens. The remaining 16 halls are equipped with Christie CP2215, Christie CP2220, and Christie CP2230 DLP digital cinema projectors that deliver superior color reproduction and brightness. All cinema halls also have line array and surround speakers from the Christie Vive Audio LA Series, S115, S215 and S218 subwoofers, as well as CDA3 and CDA5 Class D amplifiers – providing a hyper-accurate audio experience and unlocks the full dynamic range of DCI digital cinema audio and supports leading formats such as Dolby Atmos, 7.1 and 5.1 surround sound. The Christie Vive Audio system continues to establish its reputation worldwide as the next standard in immersive sound for cinema. Taichung Showtime Cinemas is also the site of the 400th Christie Vive Audio cinema sound system to be installed worldwide. Showtime Cinemas is one of the leading cinema chains in Taiwan. Established in 2002, it currently operates cineplexes in eight different locations, including Taipei, Keelong, Chiayi, Hualien, and Taitung. Showtime Cinemas is currently expanding its footprint in other parts of Taiwan, and is expected to open five new cinema complexes over the next two years. For more information, please visit www.showtimes.com.tw.